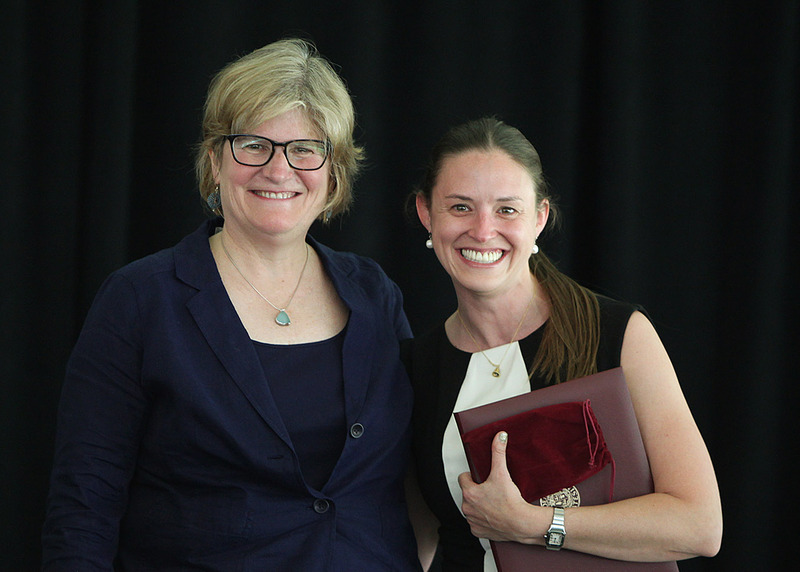 Elizabeth Metz McNab ’64 and Victoria Wyeth ’01 received Bates’ Best awards at the Annual Gathering of the Alumni Association on June 7, 2014. Presenting the awards were President Clayton Spencer and Jennifer Lemkin Bouchard ’99, president of the Alumni Association. They were joined by fellow award recipients William “Chick” Leahey Jr. ’52 (Helen A. Papaioanou Award for Distinguished Service) and Esther Rosenthal Mechler ’64 (Alumni Community Service Award) and Christian Rogers ’04 and Katherine Papadonis Rogers ’04 (Distinguished Young Alumni Award). Victoria Browning Wyeth of the Class of 2001, you have shared your passions and enthusiasm with Bates from the moment you set foot on campus. As an American cultural studies major you became deeply involved with mentoring local children in Lewiston’s public schools and community organizations. Peggy Rotundo of the Bates Harward Center recalls how excited you were to be teaching and working with children — you even encouraged your friends to sign up to mentor. Fortunately for Bates, you continue to enrich campus today as an ambassador for and expert on the artwork of your grandfather Andrew Wyeth and uncle Jamie Wyeth. You generously make time to share their art and inspiration at Bates events as near as Olin Arts Center and as far away as Paris. Through the years you have been a favorite speaker at various Bates Reunions and gallery talks at the Bates College Museum of Art. Bates students have been able to reflect on the beauty and brilliance of Wyeth art thanks to the exhibitions and works that you have brought to campus. Your emphasis on the human side of genius shines through in all you do. Though the “family business” keeps you busy, it is clear that you relish the connections you make with people of all ages and from all walks of life. Whether speaking at a prestigious gallery, in the Lewiston schools or at a local retirement community, your personal stories — delivered with your characteristic humor and energy — delight audiences wherever you go. At your first exhibition of your grandfather’s work here at Bates, you said, “I want people, particularly children, to see him as a person, to see how he worked through his ideas.” Indeed, your emphasis on the human side of genius shines through in all you do. Victoria, your critical insights and irrepressible energy are helping generations discover the power and beauty of art in the world. 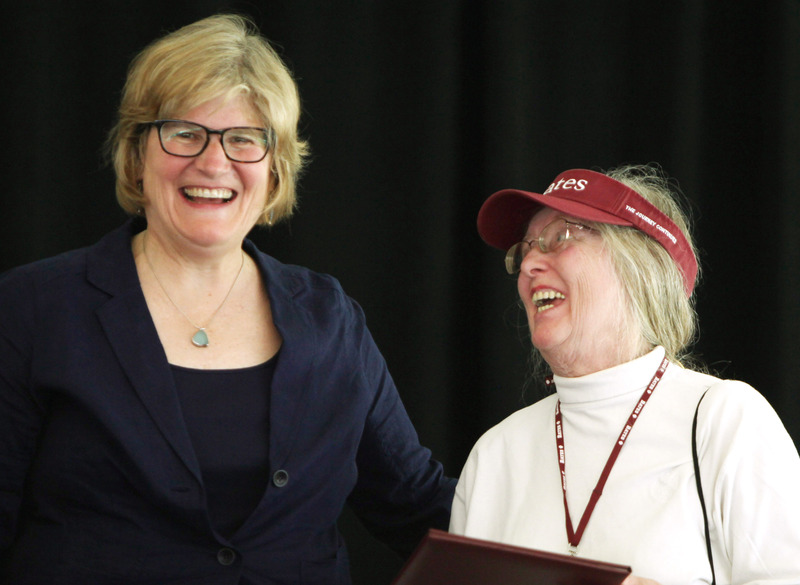 You enrich all of us at Bates intellectually, creatively and spiritually. For your continued dedication to alma mater, you are one of Bates’ Best. Elizabeth Metz McNab of the Class of 1964 has been preparing for her role as class president and Reunion chairperson since she arrived on campus 54 years ago. An English major, Elizabeth was active in the Robinson Players, Psychology Club and the Student Education Association. And it was at Bates that she met her husband, Dave McNab of the Class of 1962. Taking after her historian father, William Metz, Elizabeth maintained a thorough scrapbook of those student years, and that tome has formed the basis for this year’s 50th Reunion Class Book. The scrapbook pages reveal a Bates that looks very different from the college we know today, but a familiar sense of camaraderie, pride and excellence persists. Few embody these enduring Bates values more than Elizabeth. She has been described as the heart and soul of her class, providing unparalleled support to their Reunion planning efforts year after year. Elizabeth has chaired her Reunion social and gift committees and for the last 10 years served as Class President. Most recently she took on the demanding and rewarding role of committee chair for her 50th Reunion. Elizabeth threw herself into the 50th Reunion planning with characteristic gusto — and impressive organizational skills. Fellow volunteers marvel at her commitment to every detail, from checking the Reunion website to editing the Class Book to her steady stream of emails and letters to classmates. Elizabeth is best-known for adding a personal touch to all that she does. Many classmates who made gifts to Bates have enjoyed a phone call from Elizabeth personally thanking them for their generosity. Elizabeth, with great humor and energy you lead in a way that makes others glad to follow, and you are a joy to your friends and to your alma mater. For your generosity, dedication and love, you are one of Bates’ Best.